So it was to considerable fanfare earlier this month that BP PLC and Royal Dutch Shell PLC announced their support for federal efforts to regulate methane (Energywire, March 13). The news followed a similar announcement from Exxon Mobil Corp. in December, when it informed EPA of its support for federal methane standards on new oil and gas wells. "We recognize methane emissions are a critically important climate issue," Shell President Gretchen Watkins said earlier this month at CERAWeek by IHS Markit, an industry conference in Houston. "We support and participate in many impactful voluntary programs. But, in this instance, I believe we can do more. I want to make clear Shell's support for the direct regulation of new/modified and existing onshore oil and gas sources in the United States." The rhetoric represents a potential watershed moment for the industry, which fought former President Obama's efforts to plug leaky oil-field equipment and cheered President Trump's early efforts to roll those back. But whether the announcements portend a real shift in the industry's position on climate policy or whether they're merely an attempt to generate positive headlines remains an open question. The upside of the trio's methane commitments for climate action is tremendous. BP, Exxon and Shell not only account for a significant portion of global oil and gas production but are among the most technologically and engineering-savvy companies in the world. Advancements made by the group could help cut the cost of methane mitigation and soon be adopted across the sector. And if their efforts result in support for methane regulation from the American Petroleum Institute, the industry's leading trade group and a longtime opponent of federal climate efforts, the impact on U.S. policymaking could be substantial, industry observers said. "Savvy folks in industry will acknowledge that without a level playing field not all people are likely to come along," said Ben Ratner, a senior director at the Environmental Defense Fund. "Even if you had some companies that were proactively reducing emissions in their own operations, emissions are likely to remain unacceptably high. That is a black eye for the entire industry and the perception of natural gas and any credibility it might have in the energy transition." The majors' growing focus on methane nevertheless comes with a long list of questions, not least of which is their commitment to attacking leaks in the oil field. Just as BP announced its support for federal methane efforts, Greenpeace released a report detailing the company's lobbying efforts to weaken the Obama-era standards. The environmental group's findings were soon corroborated by the Financial Times. BP said it was simply seeking to eliminate redundancy. It supports efforts by EPA to regulate methane but not by the Bureau of Land Management. Still, the incident illustrated the lingering distrust of an industry that has long sought to block emission-reduction policies. "One way to address that is to acknowledge that you need to move forward to fix it," said Robert Howarth, a researcher who tracks oil-field methane emissions at Cornell University. "But when it is an odorless, colorless gas that people can't see, they can claim they are working hard to contain emissions but there is no way to verify it. It may not be more than marketing." Oil companies' methane commitments come at an important time for American climate policy. Methane is the primary component of natural gas, which has emerged as an ever-growing part of the country's energy mix. Advancements in horizontal drilling and hydraulic fracturing have unlocked a torrent of cheap gas from U.S. shale formations in recent years. As a result, gas has overtaken coal as the leading source of electricity generation in the United States, helping to send carbon emissions from the power sector plummeting. Its market share is projected to grow to 37 percent by 2020, up from 28 percent in 2013, according to the U.S. Energy Information Administration. Whether the fuel can be part of a broad climate solution for the United States is very much open to debate, however. Last year, a large increase in new natural gas plants was accompanied by an uptick in power-sector emissions. The increase may be an anomaly, owing to a sizzling economy, a cold winter and a hot summer. It nonetheless illustrated the limits of the fuel as a carbon-cutting device. Methane is an even bigger challenge for the industry. The gas accounts for roughly 10 percent of America's greenhouse gas emissions, according to federal estimates, but its warming potential is 34 times greater than carbon dioxide, making it a disruptive force in the planet's atmosphere. 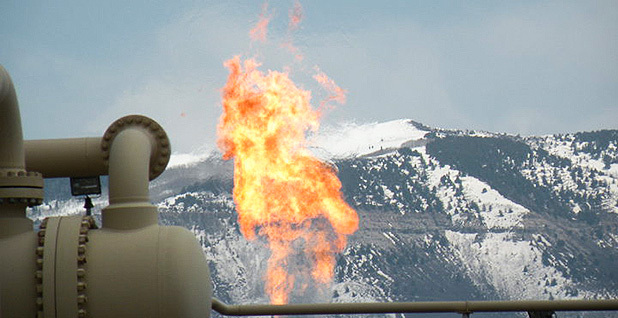 EPA estimates that nearly a third of U.S. methane emissions come from the oil and gas sector. The industry has long held up companies' voluntary efforts to reduce methane emissions as a sign that federal regulations are unnecessary. In 2014, a group of oil companies including BP and Shell formed the Oil and Gas Climate Initiative, which has dedicated $1 billion toward investments in methane reduction. Exxon joined in 2018. BP and Shell have each committed to reducing methane emissions intensity 0.2 percent by 2025, while Exxon has committed to cutting methane emissions 15 percent and flaring 25 percent by 2020. And companies have pointed to EPA figures showing consistent declines in methane emissions as evidence their efforts are working. Methane emissions were down 15 percent between 1990 and 2017, despite the fact gas production increased 50 percent over that period, Erik Milito, an API executive, wrote in a blog post last week. The trade group has continued to push for weakening federal methane rules, even as some of its largest members call for standards. In comments to EPA on its new source rule, API called for limiting semiannual inspections of well sites proposed under the Obama administration to once a year. It has also proposed exempting low-production wells from methane limits, arguing they would be economically burdensome. Environmentalists say those moves would significantly weaken the Obama-era standards. "We support controlling methane through a cost-effective regulatory framework, innovation and industry action like the Environmental Partnership," said Reid Porter, an API spokesman, referring to an industry collaboration focused on improving the sector's environmental performance. "Our industry is action-oriented and results-driven." It's not entirely clear where the majors' support for API's position begins and ends. BP and Exxon have echoed the group's call for cost-effective regulation. At the same time, all three companies have said they support regulations on both new and existing wells, a shift from the Obama years when the industry vigorously fought attempts to regulate existing production facilities. Exxon did not say in its letter to EPA whether it supported the proposals outlined by API but did express support for "maintaining the key elements of the underlying regulation." Jason Ryan, a BP spokesman, did not answer questions on whether the company supported limiting annual inspections or providing exemptions for low-production wells. Instead, he pointed to the company's internal efforts and repeated its call for federal standards, saying, "Natural gas has a critical role to play in helping the world transition to a low-carbon future, but it can only play its part if we control methane emissions." Shell went a step further than its peers. The company supports biannual inspections at well sites, along with a pathway to annual inspections at sites that can demonstrate methane emissions are under control, said Curtis Smith, a Shell spokesman. Environmentalists say more comprehensive standards are needed. EPA's methane figures are not based on actual oil-field emissions, but the projected rate of emissions from oil-field equipment. They are also self-reported by companies and not independently verified, though companies face the prospect of fines for lying to federal regulators. A growing body of academic research suggests EPA's figures consistently underestimate U.S. methane emissions. Where the agency estimates 1.4 percent of American natural gas production is lost to leaks, a study by the Environmental Defense Fund puts that figure at 2.3 percent. Howarth, the Cornell researcher, thinks the number could be higher still, at around 5 percent of U.S. natural gas production. The small percentage-point difference is consequential. Natural gas has long been touted as a cleaner alternative to coal, but it loses its greenhouse gas advantage over the black mineral when methane leaks exceed 3 percent of production, according to the Carbon Disclosure Project. The economic incentive for companies to reduce leaks, meanwhile, only goes so far. Small methane leaks can be expensive to plug but are still detrimental to climate, said Daniel Raimi, a senior researcher at Resources for the Future. And, in the case of oil production, it's often cheaper for companies to flare off associated gas than capture it. Raimi described the dynamic like this: "I have an economic incentive to pick up a penny on the ground, but it may not be worth my time. If it's a $10 bill, I'm going to pick it up. Companies have an incentive to reduce emissions, but they are only going to do it if it's profitable for them." The change in tone by the majors on methane reflects growing acknowledgment of the science, analysts said. It also follows increased scrutiny from investors, who have pressed companies to disclose their emission figures and demonstrate their commitment to reducing methane leaks, analysts said. Oil companies increasingly realize they cannot be on the wrong side of the climate debate and are under pressure to offer solutions for reducing emissions, said Arvind Ravikumar, who studies oil-field emissions at Harrisburg University. "There are a lot of things coming together right now, and companies are compelled to make statements and even take action on climate change," he said. "I think a lot of them are seeing it and realizing this is going to come much faster than they anticipated." A bigger question is what role the majors' announcements will have on the industry at large. In the United States, the major oil companies have taken a back seat to independent oil and gas producers in the so-called Shale Revolution, meaning much of the new production in America today is not covered by the majors' methane targets. There's also this: Production sites are only a piece of the methane puzzle. Methane leaks occur along pipelines, at processing facilities and in utility gas distribution systems, yet to date federal efforts have largely focused on well sites. Downstream gas operations accounted for 18 percent of the industry's methane emissions, according to International Energy Agency data compiled by the Carbon Disclosure Project. "I think that this is early," said Deborah Gordon, a senior fellow at Brown University's Watson Institute. "It is a really important problem, and we're just starting to get a handle on what it is and how to fix it." Correction: An earlier version of this story misidentified a BP spokesman.